Earlier this year, the Trump administration imposed 25% tariffs on imported steel. Steel that is often used in manufacturing. Louisiana is not a major steel producing state, but it is a heavy steel consuming state. Steel is used by the petrochemical industry and other manufacturers. Some of that steel is imported because it is cheaper. But even with the imported steel, most steel produced in the U.S. is manufactured in the country. Imports only accounted for 31.3% of U.S. steel consumption even before the Trump administration’s tariffs took effect. 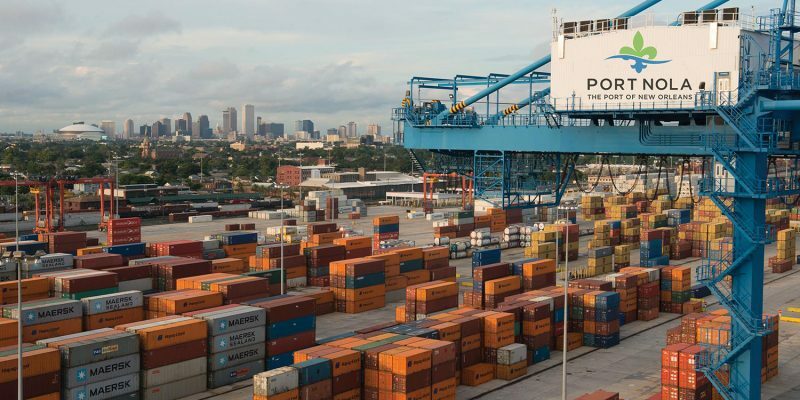 The decline in steel imports is hurting the Port of New Orleans, which is one of the largest ports in the world. Steel imports have declined over 25% from this time last year. From the West Coast to the Great Lakes and the Gulf of Mexico, at least 10 percent of imports at many ports like the Port of New Orleans could be hit by new tariffs if Trump’s proposals take full effect, according to an exclusive analysis of government data by The Associated Press. In New Orleans, port officials say a tariff-related drop in shipments is real, not merely a forecast. In the first six months of this year, imports of steel and nonferrous metals were down by more than 25 percent from a year earlier, according to the port’s chief commercial officer, Robert Landry. But the tariffs’ impact is likely more pronounced than the numbers suggest: The beginning of the year was lifted by a rush of shipments trying to get ahead of the tariffs, which went into effect midway through the period. Unless changes are made, “When we run this report again, at the end of the year, we will see June through December has a real possibility of being even lower,” Landry said. It’s not just the port and its workers that are going to be hurt in this trade war. The petrochemical industry and other manufacturers will be hurt because they will have to pay more money for their raw materials. Other countries are retaliating against American products. Louisiana is a major agricultural state and it has fallen victim to other countries retaliatory tariffs. The point of this trade war is to supposedly increase access for American goods overseas. It is also designed to protect American industry from foreign competition. On one level you could make an argument that it is working. After all, steel jobs are being added and manufacturing jobs are at their highest level in 14 years. But as these jobs are created by tariffs, far more jobs will be lost as a result of them. We’re already seeing it at the port where hours are being cut. Eventually, those losses will ripple down to supporting industries such as trucking and the railroad. Finally, tariffs open the door to cronyism and the government picking economic winners and losers. This trade war needs to end soon or Louisiana’s economy will begin to suffer.